It’s officially trout season in San Diego – Santee Lakes kicked things off on the 4th of this month with their big opener and several other local lakes are gearing up to plant trout this weekend. We keep a running schedule throughout the season of all trout plants: San Diego Scheduled Fish Plants. Its updated as new information becomes available, so check back frequently. The kids only (15 and under) pond known as Chollas Lake receives rainbow trout from the California Department of Fish and Wildlife. Unfortunately, the CDFW does not release fish stocking plans more than a week or two in advance, and nothing is on the schedule. Chollas will receive trout, but nothing is scheduled yet. They received catfish however, planted by the CDFW the week of October 15th. Lake Cuyamaca is the only lake in San Diego County which enjoys a year-round trout season due to their high elevation and cooler annual weather. Cuyamaca receives trout from Wrights Rainbows (1,500 pounds per stock), Jess Ranch (1,200 pounds per stock), and the CDFW. So there is a nearly constant supply of fresh trout in this mountain retreat. Diamond Valley will kick off their season November 16th with 4,000 pounds of rainbow trout from Mt. Lassen Trout Farm. They’ll also likely receive regular stocks from the CDFW this year. DVL typically receives some “exotics” as well – like brown trout on occasion. Dixon’s trout season gets underway with their first stock (4,000 pounds) of the season on Wednesday, November 15th. The city of Escondido, which operates Dixon and Wohlford has made the switch to Calaveras Trout Farm this year instead of the “Nebraska Tailwalkers” from Chaulk Mound Hatchery in Bridgeport, Nebraska. The jury is out on Calaveras’ trout, which come from Merced, CA. Dixon does not receive CDFW trout. The small Doane Pond on Palomar Mountain is stocked by the CDFW, and there are no scheduled stocks posted at this time for Doane. It last received trout the week of July 2nd. Jennings is another lake which is making a switch in trout suppliers this season as Mt. Lassen made the business decision to no longer deliver to San Diego County due to the distance. So Jennings will be going with Wright’s Rainbows this year, and kick off their trout season on November 17th with an initial stock of 2,500 pounds prior to opening day. Jennings will stock again the following week with 1,500 pounds, and do that pretty much every other week through the middle of April. The CDFW will also likely stock some of their small hatchery trout at Jennings this year. Lakeside’s small urban fishing pond, Lindo Lake is likely to receive CDFW trout again this year on a regular basis, but no dates have been scheduled. Lindo’s water temperature will not likely allow for trout for another month or so. Lake Miramar in Scripps Ranch will likely receive CDFW trout this year, but no dates have been scheduled yet. The city of San Diego abandoned their stocking program several years ago, so their lakes rely solely on the state to provide trout for anglers. Lake Morena will begin stocking trout in early December, though no official date has been released. They used Jess Ranch trout last year, and have announced no intention of changing this year. Morena also receives trout from the CDFW throughout the season. Like Miramar, Murray will rely solely on CDFW trout again this year, and no dates have been scheduled so far. Lake Poway will launch their trout season on November 30th with a plant on November 29th. The lake will be closed to fishing on the 29th. Poway does not receive trout from the CDFW. San Vicente Reservoir may or may not receive trout this year from the CDFW. The state snuck a few stocks in over the last couple years at San Vicente, but made no official announcements of them taking place. So there’s no reason not to expect the same from the CDFW this year, they may or may not plant trout at San Vicente, and they may or may not tell anyone if they do. Santee Lakes does trout season BIG! Their opening weekend on November 4th and 5th featured 2,500 pounds of rainbows from Calaveras Trout Farm. They spread them out among lakes 2, 3 and 4. They’ll be stocking a couple times per month now through March 9th, the final stock of the season. Santee Lakes offers tons of ways to win prizes for their trout season, including trophy trout and tagged trout. Lake Skinner kicked off their trout season with a 600 pound plant of rainbows on November 8th. They’ll follow that up with another 600 pound stock on November 22nd, and then continue with about 2 stocks (600 pounds each) per month through March 28th. Skinner also typically receives CDFW trout, but nothing is on the schedule right now. Lake Wohlford will plant a huge 6,000 pound order of trout ahead of their trout opener on December 9th. Like Dixon, Wohlford is switching from Chaulk Mound to Calaveras Trout Farm this season. Currently open on weekends only, Wohlford will switch to their trout season schedule on December 9th which keeps them open daily. Wohlford also receives trout from the CDFW throughout the season, but nothing is scheduled yet. 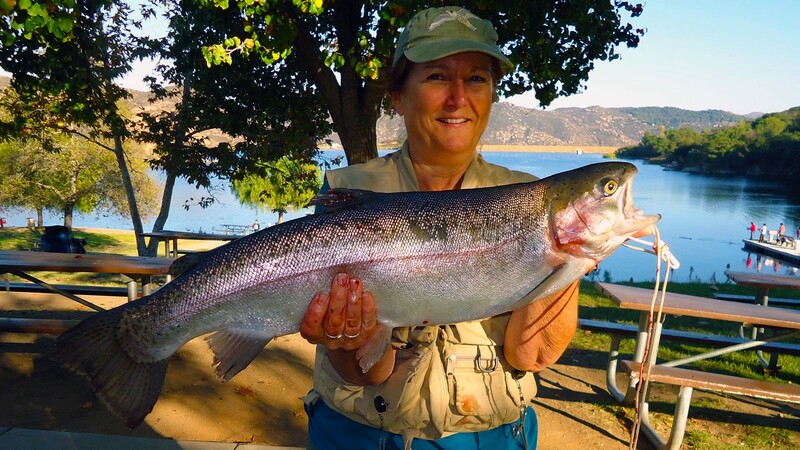 The State of California’s trout program supplies several local reservoirs with catchable rainbows. CDFW trout average 2.0 per pound (1/2 pound each), but are all of “catchable” size. This means that in general, CDFW trout are much smaller than the private suppliers, making their plants a favorite more amongst trophy bass anglers than trout anglers. The CDFW does not announce trout plants more than a week or 2 in advance at the most, and they do not divulge the actual stocking date, only “week of”. On top of that, they do not release the amount of fish, nor the weight of the stock as public information. However, stocks have typically totaled about 400 pounds per lake, roughly 800 catchable rainbows each. The Calaveras Trout Farm is going to play a big role in San Diego’s 2017/2018 trout season, replacing Chaulk Mount and Mt. Lassen for several of the local lakes. Calaveras Trout Farm is located about 400 miles north of San Diego County in Snelling, CA. Jess Ranch has been delivering rainbows to San Diego County for several years now at Cuyamaca, Santee Lakes, and Morena specifically. Their hatchery is in Apple Valley, CA outside Los Angeles about 150 miles north of San Diego County. Wright’s Rainbows are new to San Diego, Cuyamaca was the first to start using this hatchery out of Thatcher, Idaho. Sherman Wright has reportedly raised and sold his trout to restaurants for more than 25 years, but only began selling them to recreational fisheries in 2011. This year his trout will be tugging on anglers’ lines at both Jennings and Cuyamaca – both operated by the Helix Water District.